Vogue Cafe has opened it's second location in the world at Dubai Mall. The first location is in Moscow, Russia. The location had it's grand opening event a few days ago and many were in attendance including models Petra Němcová and Karolina Kurková. The cafe serves contemporary European dishes and of course you will find issues of Vogue magazine there to peruse through. 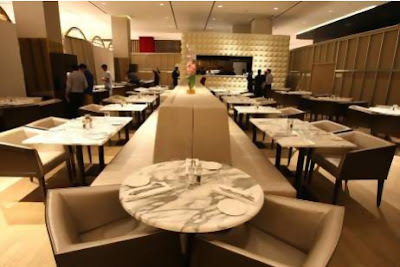 The cafe is very modern and chic inside and serves as a great location near shops like Berluti and Valentino. Conde Nast, publishers of Vogue magazine, are hoping to expand by developing the Vogue lifestyle brand to include bars and several restaurants. Hopefully this new venture will serves as a way to increase revenues considering the drop in revenue in the magazine business. It will be interesting to see if this lasts because I remember in the mid 1990s when the Fashion Cafe was launched with the likes of Naomi Campbell, Elle Macpherson, Christy Turlington and Claudia Schiffer as the faces of the brand. Unfortunately the New York based restaurant failed and closed down. I'm sure Vogue will not encounter the same problems and will likely be a success with it's new venture.